Last night's "Countdown with Keith Olbermann" on MSNBC included an oddball-ish moment from the National Prayer Breakfast. "And in a lighter, but in some ways more disturbing note about Iraq, at the National Prayer Breakfast this morning in Washington, when Laura Bush asked her neighbor for coffee, the chairman of the Joint Chiefs of Staff, General Peter Pace, stood up, poured the first lady a cup of Joe, did not pour one for the president, put down the coffee pot, then went back to his own seat. "The whole exchange triggering some kind of primeval response in the president, who stood up, gestured at the blushing chairman, retrieved the coffee pot, returned to his own seat and poured himself a cup of coffee to hearty guffaws all around. He then appeared to change course, standing up to take the coffee back to General Pace, filling his cup up, as the chairman of the Joint Chiefs of Staff clearly showed his continuing embarrassment, embarrassment over coffee." The general also missed filling the cup of the person to the First Lady's right. That person was Dianne Cleaver. She and her congressman husband, Emanuel who led the prayer service, were among those participating in those hearty guffaws and shown throughout the video. It was quite the primetime night for the Mo-Kan congressional delegation. Kansas Sen. Sam Brownback was featured in one clip on the "Daily Show with Jon Stewart." UPDATE: Cleaver spokesman Danny Rotert has helpfully provided links after reading the original post. If you want the conservative take on the moment, check out Fox News. If you want the bash Bush take, then check out MSNBC's. 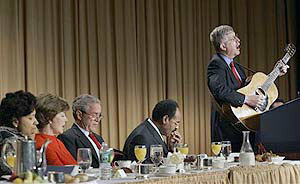 President and Mrs. Bush, along with Rep. Emanuel Cleaver II and his wife Diane, listened as Dr. Francis Collins, head of the Human Genome Project, sang and played guitar this morning during the National Prayer Breakfast. "I think that had Sen. Biden not been a strong supporter of civil rights, had he been someone who, over his years of public service, had a shaky relationship with African Americans, I think we would all need to be very upset over his comments. But obviously he has done thing likes this before. We realize he made a mistake. He was putting his tongue ahead of his brain. I don't think you're going to find any African Americans who are going to be upset with him. He's a friend, always has been." The editors at foodie mag Bon Appetit gave four stars to Rep. Emanuel Cleaver's cooking grease-powered bus that he uses to travel his district. "In a town of ribs and fries, could there be a more perfect way to travel?" Cleaver tells their blog this morning. He has been pushing alternatives fuels. A Cleaver bill says his colleagues can only use their office allowance on cars if they run on alternative fuels. Cleaver aide Danny Rotert tells Roll Call, the Capitol Hill newspaper, that the aroma of barbecue lingers inside the bus. The only question we have is, when constitutents seek assistance as the bus rolls through their neighborhood, do Cleaver aides follow the teachings of one of Kansas City's legendary lords of barbecue and shout, "May I help you? Missouri Rep. Emanuel Cleaver met with President Bush today to discuss plans for the National Prayer Breakfast, which Cleaver is co-chairing this year with Rep. Jo Ann Davis, a Virginia Republican. The breakfast is Feb. 1. Like many members of Congress, Rep. Emanuel Cleaver of Missouri has a publicly paid mobile office in his district to help with constituent service. Unlike most, Cleaver's doesn't run on gas or diesel. He retro-fit it to run on used cooking grease. That means a fill-up costs 70 cents a gallon, kids. "We are taking a normally discarded waste product and turning it into a replacement for foreign oil," Cleaver said. "And, honestly, the humor is not lost. In the town of ribs and fries could there be a more perfect way to travel?" Missouri Rep. Emanuel Cleaver was named Second Vice-Chair of the Congressional Black Caucus today, joining the policy-making executive committee of the 43-member group, all Democrats. Cleaver was recruited for the position by CBC leaders. Why? "To add a voice of progressivism flavored with Midwestern moderation," Cleaver said, explaining he is the only CBC member from a district with a black population of less than 30 percent (MO-5 is 23 percent black). UPDATE: Cleaver said his top priority as an officer for the CBC will be to end the state election laws that require voters to present state-issued identification to vote. "Congressman Ike Skelton, my friend and member of Congress for 30 years, couldn't vote because he showed up at the polls and didn't have a driver's license -- Ike has polio and can't use his arms and has no need for a license. That kind of foolishness has to stop." He added that the CBC leadership would work "to make certain CBC members are given optimum consideration" for important committee posts. Given the ire between the black caucus and incoming House Speaker Nancy Pelosi over her decision to pass over member Alcee Hastings to lead the House Intelligence Committee, Cleaver said he expected that effort would be easier because Pelosi "realizes there's a great deal of disappointment in our caucus over the Hastings decision."